The Chiang Mai Municipality held a workshop on June 27, 2013 in conjunction with Nakornping Hospital to train teachers and school personnel in how to control and spot diseases as well as training in emergency first aid treatment in case of accidents. Tassanee Buranupakorn, Member of Parliament for Chiang Mai chaired the workshop that included two lectures on childhood diseases and how to keep nurseries and schools disease free. 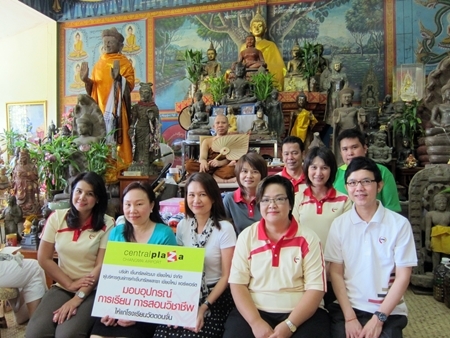 Additionally Sirimangkalanusorn School received a certificate for its nursery being disease free. MP Tassanee noted that the rainy season saw the prevalence of diseases such as foot & mouth, dengue fever and influenza and that teachers and school personnel needed to increase awareness for spotting and having these illnesses treated quickly, especially in the higher risk age groups such as those under 5 years old. Central Plaza Chiang Mai Airport personnel joined Central Pattana Public Company Vice President of Property Management Orachorn Chantarawiwattana (2nd Front Left), and Tanatchaporn Pongyen (3rd Front Left) General Manager of Central Plaza Chiang Mai Airport in presenting donations to Wat Don Chan abbot Phra Kru Prachanardmunee for the school there. The abbot received donations of sports equipment as part of Central Pattana company’s program “Cultivating Wisdom CPN Thailand” to promote education for youth in Thailand.